Chromis leucura Gilbert 1905, theWhitetailed Chromis. To two inches. Forked caudal w/ longer trailing elements. Usually deeper water, 100' plus. Indo-Central Pacific. This one off of Kona, HI 2019. Plectroglyphidodon johnstonianus (Fowler & Ball 1924), the Johnston Island Damsel. Despite its common name this species is found more widely in the Indo-Pacific, eastern Africa to Hawai'i (where this image is from). To two and a half inches long. Exallias brevis (Kner 1868), Leopard Blenny. Indo-Pacific; Red Sea to Hawaiian, Marquesas Islands. To almost six inches in length in the wild. Obligate feeders on live coral polyps. Definitely NOT reef safe. Still offered on pet-fish markets on occasion. A juvenile down south off of Kona, HI 2019. 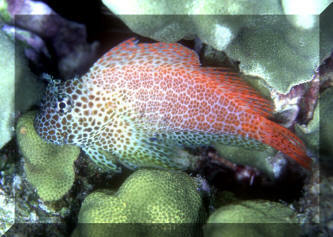 Exallias brevis (Kner 1868), Leopard Blenny. Indo-Pacific; Red Sea to Hawaiian, Marquesas Islands. To almost six inches in length in the wild. Obligate feeders on live coral polyps. Definitely NOT reef safe. Still offered on pet-fish markets on occasion. A male in Oahu, Hawai'i.